Learn the difference – and strategies – you can use to combat them both, with a risk-free copy of this timely report on memory. Where did you leave your car keys? What did you walk up the stairs for? Who was that person you were just speaking with at the mall? We’ve all been there. Those slight lapses of memory. Often times, there’s so much going on in our lives and our minds, that we forget an occasional thing or two. But still, we stop and wonder: is it just a “senior moment” or could it be something worse? Now comes a brand new report from Massachusetts General Hospital, COMBATING MEMORY LOSS, that gives you the insight and information you need to understand the differences between age associated memory impairment and early forms of dementia … to learn what you can do about it –from developing coping strategies to slowing down its progress … to enabling you to have frank, informative conversations with your doctor about your own mental health and well-being. Are you predestined to suffer from memory loss? We all forget things. Even as kids we were forgetful … leaving our lunch or homework at home or on the bus. And as we age, we become more forgetful. While it’s a nuisance, it’s also not a progressive condition. But when it becomes more than an occasional occurrence, we have every right to be wary. COMBATING MEMORY LOSS is packed with the latest studies and research to help you recognize the difference – whether it’s forgetfulness associated with normal ageing, or an actual change in brain function leading to dementia. Did it happen suddenly (often the result of small strokes)? Or is it happening gradually over time (Alzheimer’s disease)? Calculate your own personal risk of developing dementia. Today, over 5 million people are afflicted by Alzheimer’s disease. It could be over 16 million by the middle of this century. COMBATING MEMORY LOSS shares with you the medical community’s advances as they fight this tragic disease, including the spirometry study that suggests that poor lung function is associated with an increased risk of Alzheimer’s disease. 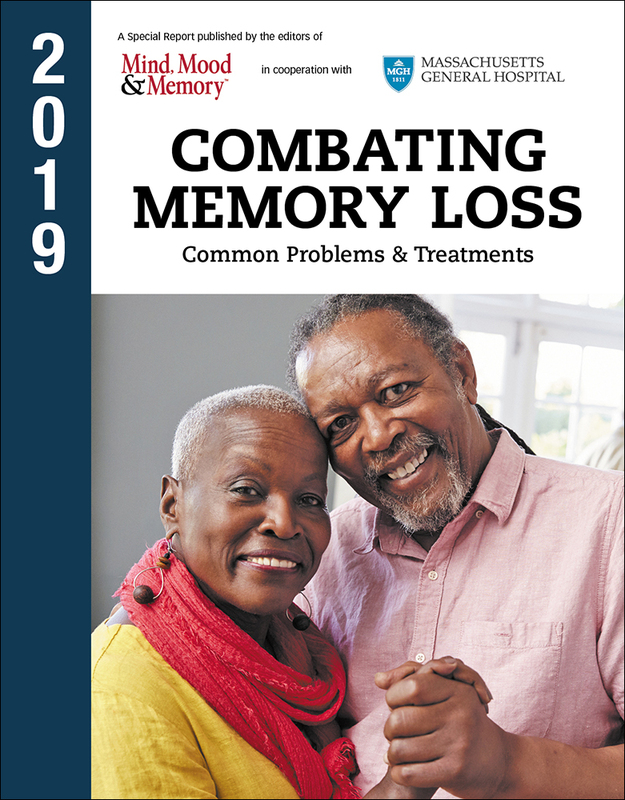 Get the authoritative 2019 report Combating Memory Loss from Massachusetts General Hospital. Get the latest research and studies to help assess your own risk and learn the precautions you can take. COMBATING MEMORY LOSS even includes a section on how you can determine your own risk for Alzheimer’s disease. Age, gender, education, blood pressure, cholesterol and body mass index all play a role. And you’ll learn what you need to do in each area to make a more positive impact in your own life. Some forms of dementia are reversible! Discover the precautions you can take! Sadly, Alzheimer’s disease is still not reversible. But some other forms of dementia are. Did you know that chemotherapy can contribute to memory loss? Taking a common medication for overactive bladder can, too. Even early changes in insulin processing – the first steps towards diabetes – can lead to memory dysfunction. COMBATING MEMORY LOSS gives you a clear understanding of what you can do to protect yourself and your mental functions when faced with some forms of dementia caused by stress, thyroid conditions, drug interactions, even vitamin B-12 deficiencies. COMBATING MEMORY LOSS updates you on future breakthroughs. The good news today is that drugs for severe dementia like Parkinson’s and Alzheimer’s disease really do work. Whether it’s as simple as a new patch that makes it easier to administer medication … or the finding that a drug used to treat prostate cancer may be helpful in the battle against Alzheimer’s disease. COMBATING MEMORY LOSS shares with you what’s in the pipeline now. Studies on biomarkers in the cerebrospinal fluid … blood tests that distinguish high-risk proteins … an Alzheimer’s disease Prediction Method that can recognize key risk factors 20 years in advance … even a basic smell test (did you know that Alzheimer’s patients have difficulty identifying the scent of lemons and bananas?). There’s even a new drug that uses antibodies from your own immune system to attack and destroy plaque build-ups in your brain. And wait until you read about a promising study involving mice focusing on an agent that may even help reverse memory loss. That’s the future. What can YOU do right NOW? Exercise your body and brain by learning new skills. Keep active. Stay organized. Eat healthy. And definitely, don’t smoke. While all those hold true for leading a healthy life, they’re of particular importance for your own mental health. For example, smokers are twice as likely as non-smokers to develop Alzheimer’s disease. COMBATING MEMORY LOSS gives you tips, ideas and insight into what you can do right now to live the most healthy – and mentally healthy – lifestyle for years to come. Order the new edition of COMBATTING MEMORY LOSS today! COMBATTING MEMORY LOSS is available now at the lowest price ever! A very small price for information that can impact your health in so many ways. Click here to place your risk-free order. After you receive the book, review and learn from it. If, within 30 days, you are not 100% satisfied with the information in the report, call, write or email us and we’ll gladly refund you your full payment. And to ensure that you stay on top of important findings as doctors and researchers continue to study memory and ways the mind works, we will reserve future annual editions for you on a priority basis and at our lowest price. We will notify you by postcard or email before the next edition is released and shipped to you. If you don’t wish to receive it, just return the card within 30 days. You will also be able to review each future issue before deciding to keep it.